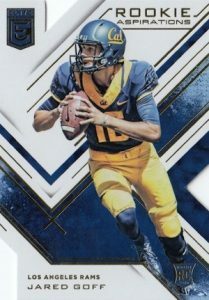 Back for another run with collectors, 2016 Donruss Elite Football mixes brand staples and a new focus on hard-signed content. 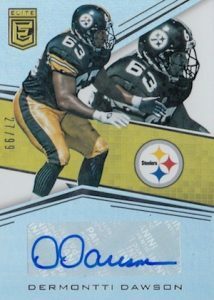 Every hobby contains two signatures, including one on-card autograph. Showcasing bright and bold patterns, the main base and rookie set includes a mix of parallel colors such as Gold, Blue and Orange. 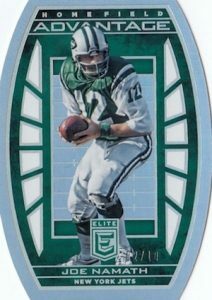 Likely to please those who have been clamoring for more on-card options, Pen Pals lead the way for 2016 Donruss Elite Football and average one per box. The checklist includes many of the top 2016 rookies. There are also case-hit Pen Pals Triples as well as limited SSP Ink Variations that utilize ink colors like Green. Other signed inserts include Turn of the Century Autographs that also come in Orange and Gold parallels (#/10). A key insert in the brand’s history, Passing the Torch dual autographs are limited to just 25 copies. 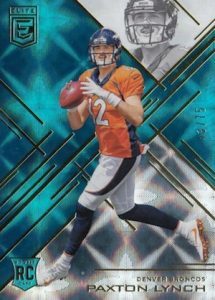 Memorabilia cards are another main component in 2016 Donruss Elite Football. 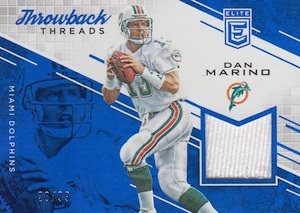 Dropping one per box, several designs highlight quality relics in Epic Materials Super Prime, Prime Numbers, and Throwback Threads Super Prime. There are also limited signed versions. 2016 DONRUSS ELITE LENOTE CARROO WR MIAMI ROOKIE PEN PALS ON CARD AUTO MINT! PARALLEL CARDS: Retail Green, Black #/199, Green #/99, Teal #/75, Red #/49, Purple #/25, Orange #/10, Blue #/5, Gold 1/1. 10 cards. Serial Numbered #/299. PARALLEL CARDS: Prime #/49 (Card #9 - #/10), Super Prime 1/1. PARALLEL CARDS: Green, Red #/75, Purple #/49, Orange #/25, Blue #/5, Gold 1/1. PARALLEL CARDS: Prime #/99 or #/49, Super Prime 1/1. PARALLEL CARDS: Base #/99 or #/49, Orange #/10, Gold 1/1, Red 1/1. PARALLEL CARDS: Blue #/10, Gold 1/1. PARALLEL CARDS: Prime #/25 (Card #5 - #/10), Super Prime 1/1. *Cards #3 and #6 not included in Prime parallel. PARALLEL CARDS: Green, Red #/75, Purple #/49, Orange #/25, Blue #/10, Gold 1/1. PARALLEL CARDS: Green, Red #/49, Purple #/25, Orange #/10, Blue #/5, Gold 1/1. PARALLEL CARDS: Green Ink, Red Ink. 10 cards. Tier and serial numbering noted below. 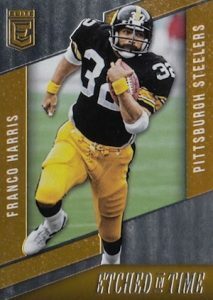 PARALLEL CARDS: Prime #/49 or less, Super Prime 1/1. PARALLEL CARDS: Green (No card #29,30), Orange #/10 or #/5, Red 1/1. 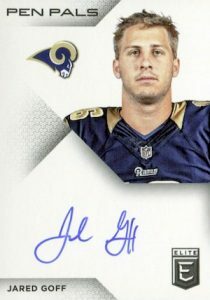 I hope those are just a lazy effort by Panini on the RC mock ups, 2015 rookies in a mid-16 release just doesn’t work for me. Toby � You are correct. Not sure why, but that is how they have issued all the mock-ups. Actual cards will feature 2016 rookies. I would have given this product at least a 4 Maybe a 5 but many of the cards I got have issues with the foil peeling off the front. Luckily most of it is base but I did hit an Eli manning auto /10 with the foil peeling on the corner. Other than that the product looks fantastic! 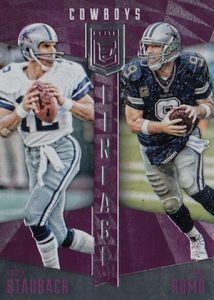 In the “Throwback Threads” checklist it says “*Cards #2 and #12 not included in Prime Parallel.”….. I think this is a mistake tho. 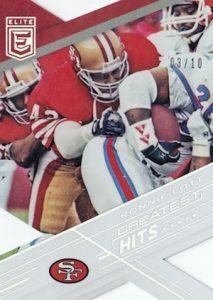 I hit a Warrick Dunn /49 in a break the other night. 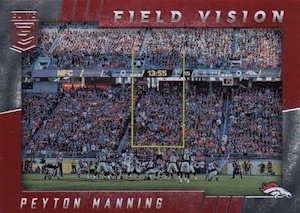 I noticed the * next to Marino which is card #3. Perhaps it should say cards #3 and #12 not included. I give it ???. There were a lot of numbered cards out of the box I pulled from. 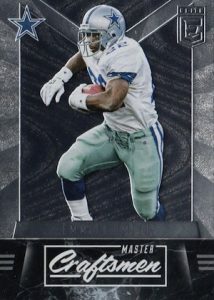 I pulled a Bo Jackson /99 (beautiful card). I also pulled an Emmitt Smith Faces of the Game Gold /25. Finally, I pulled a Ron Mix auto /99. This is a respectable box. 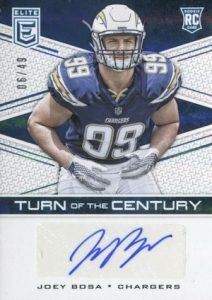 Do you all know the print run of the triple Red Ink Autos? 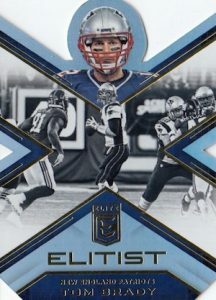 This year’s Donruss Elite set feels a lot more like the Elite sets I loved prior to Panini buying Donruss. Elite was one of my favorite products and I felt it took a serious dip in quality for a few years but I am really liking the direction it’s going in. Well done Panini! The rookies in this set are 3 to a box, and they should all be listed as SP’s..100 rookies at 3 a box, equals almost 35 boxes with no duplicates to get the set..
Have you seen base card rookies normally @ed to 199 but without a ser #; black variety? The triple rookie sigs. Is the red a 1/1?